"White Elk Township, Aitkin County, Minnesota"
This is the homestead of James Henry Olds and his wife, Martha. The baby being held is Steve's Grandfather Wilbur Olds who was born in November, 1908. The same homestead is marked on the USGS topographical map below. 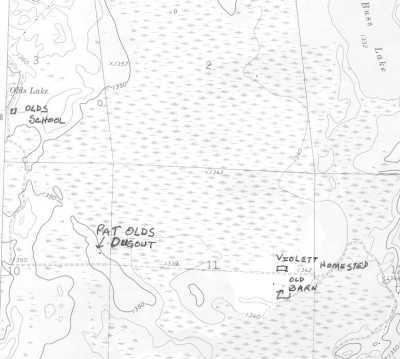 Steve's Great Uncle William Violett gave him the map. The Violetts lived in Bain at one time. 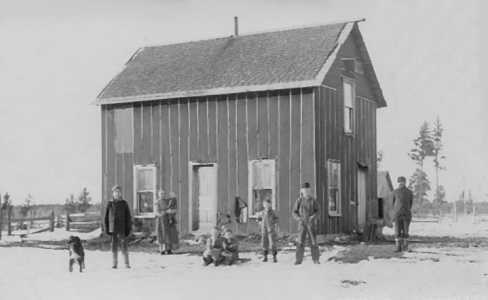 Olds School, Pat Olds' Dugout, Violett Homestead and Old Barn. Ruby Violett Olds was Steve's grandmother. The dugout which Pat Olds built. He lived in it for several years, trapping in the area. Clyde Olds with hat, Pat (Elmer) Olds, Harry, Hazel and Goldie. Edith is not pictured. She was visiting Aunt Rachel Olds. the gun is as tall as he is. Olds School located on White Elk Road. This is the school Ida Lueck mentioned in her Journal. These words, on paper, are family stories and events that were related to me mostly by my grandmother Ruby Violette Olds. They were told during meals or at other family gatherings. 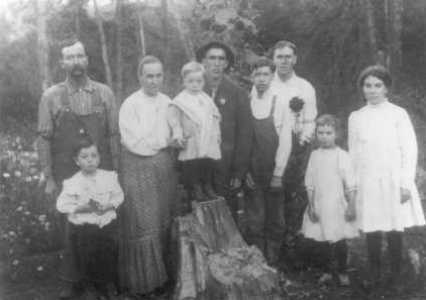 The Olds family came to Aitkin County in the early 1900’s to homestead land and start a new life. 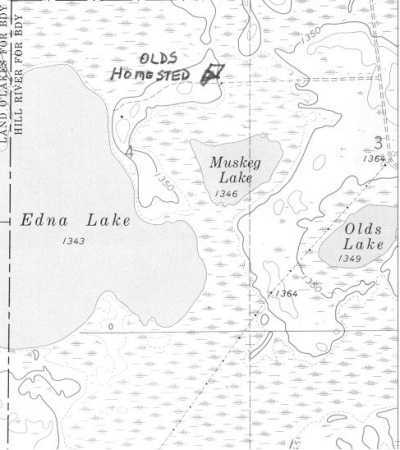 They homesteaded in the White Elk Township just east of Edna Lake and north of Muskeg Lake. 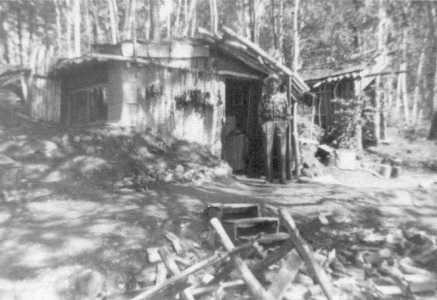 Homesteading land in Minnesota’s North Woods was not as easy as the government may have led some to believe. 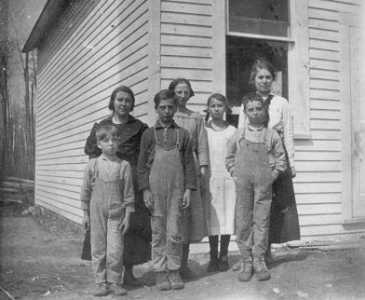 The life the homesteaders led was full of adventures, dreams and downfalls. 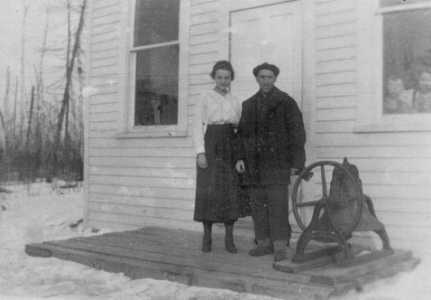 James Henry Olds and Martha Goldsberry Olds moved all their belongings and five children from Fillmore County, Minnesota, to Aitkin County in 1902 or 1903. Four more children were born at the new homestead. One infant was buried there. The grave was marked by four wooden posts and a wire fence. The posts have decayed now and the fence has fallen and the grave is covered with leaves. To prove a homestead the families had to make land improvements. To make a living and to improve the land was hard. There was no easy work. Farming was the main industry. The Olds family attempted different crops. Many crops failed due to the weather and/or the wet ground. The main crop, the real moneymaker for the homesteaders, was hay that could be raised in the cleared meadows and sold to the logging companies for their horses and oxen. Finding work in the winter months was easy if one wanted to work for the logging companies that were clear cutting the timber in the North Woods. It was said that clear cutting was meant to help the North Country grow. During the winter months the lumber companies cut trees and hauled them to holding ponds on huge sleds pulled by horses or mules. This was somewhat easy on the frozen ground. With spring came the thaw, and the logs were ready to head downstream. Now if one were still itching for money the new job might be a log driver called a "river pig." If you were a river pig your job was to ride the logs down the river keeping them from becoming hung up or jammed up along the way. With long poles in hand you jumped from log to log on this massive Huck Finn-looking raft, trying to keep it headed in the down-stream direction. The long hours on the river and the wet conditions were hard. The river pigs wore wool pants and shirts and long winter underwear to stay warm. Even when wool is wet, it is much warmer than cotton. To keep their skin from becoming chafed the men rubbed bacon grease on their skin. 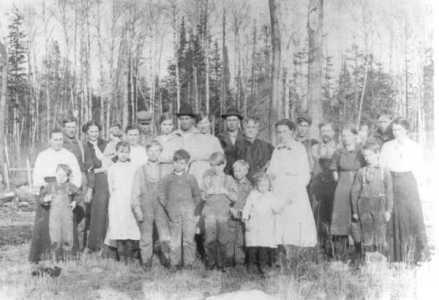 Most of the homesteaders found that the abundance of wildlife was another way to keep the family fed. 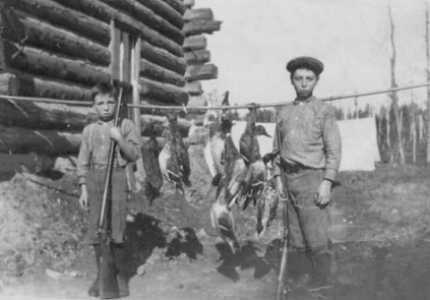 The men of the Olds families found that hunting and fishing was not such a bad way to provide for the family and they all became very good at this new kind of sport. Deer season? What deer season? The need for food was more important than what was in season. The same was for fishing and its limits. A lot of the men were taking game out of season. Once, Great Uncle Pat Olds had a pot of illegal venison stew cooking on the stove when the game warden walked in and caught him. The game warden took the stew right off the stove and along with Uncle Pat to jail. Pat later laughed because they couldn’t find all the meat that he had canned and buried in the ground. The homesteader did not always follow the game laws and licenses that went into effect around 1899-1900. Minnesota at the turn of the century was a sportsman’s paradise. My grandmother Ruby said the men in the Olds family thought that hunting, fishing and other game laws and licenses were meant for other people rather than them and for the unlucky ones that got caught. A related family member, Loe Olds at one time worked for the U S Postal Service. He was also a pioneer photographer along with a friend of his by the name of Newlon Harrington. Most of the family photos that I have were given to me by my grandmother Ruby Olds, and were taken by Uncle Loe Olds. I wish some of the people were here now to see the good use they are being put to on the Aitkin County Genweb site. Well, "fiddle sticks," as my grandmother would say, I’m about out of things and stories to bore people with. Some of the surnames of the people related to the Olds family by marriage are: Violette, McAnninch, Ward, Clayton, Seymour, Gobel, Goldsberry, Ramey and several others. Some of the families lived in nearby Swatara, Bain, White Elk and other townships. Just to end this I am grateful to all family members that lived and homesteaded during those hard times in that difficult land, for as anyone that lives in Aitkin County, or that did at one time, would say, it must have been hard to make an easy life in the early 1900’s headed out the log cabin to chop a hole in the ice for water with four feet of snow on the ground and the temperature 30 below with the wind blowing. I appreciate all of you, the real pioneers, who tried your best to break this hard land.